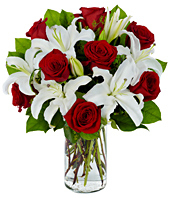 Flower Arrangement with a combination of white lilies and red roses. Comes in a clear round vase. Fresh flowers always. Send flowers online.